The marine economy in Mekong Delta’s Kien Giang Province has developed rapidly over the past five years after local government investment of VND111 trillion (US$5 billion) in the 2011 – 15 period, Vietnam News Agency reported. Funds earmarked for marine infrastructure and national defense contribute up to 80 per cent of the province’s total investment budget, according to Kien Giang Province’s People’s Committee. The funds have been used to build and upgrade the seaports, airports and transport systems of Phú Quốc Island and surrounding islands, including Lại Sơn, An Sơn, Thổ Châu, and the sheltering area for boats in Kiên Hải District. Electricity grids on Phú Quốc Island, and Hòn Tre Island in Kiên Hải District were built amongst other projects. The projects helped improve conditions for people living in coastal regions and islands in the province. Phạm Vũ Hồng, chairman of Kien Giang Province’s People’s Committee, said the province’s marine economy had developed well, growing on average 11 per cent per annum. 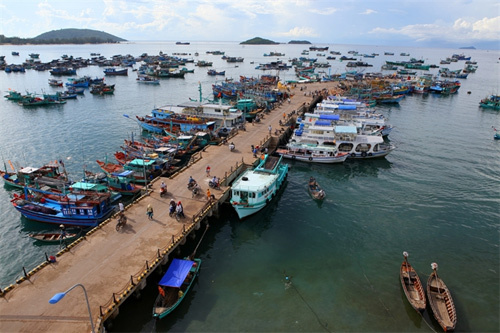 The marine economy contributes 73 per cent to Kien Giang’s GDP. Fishing, aquaculture, marine services, seafood processing and marine tourism have made strong progress in the past five years. With better infrastructure, the province has been able to attract strategic investors to Phú Quốc Island. Between 2016 and 2020, the province will continue to invest further in socio-economic infrastructure, making Kiên Giang one of the most developed provinces in the country. The province will invest further in major projects, including the Southern Corridor between Hà Tiên Town and Rạch Giá City, Hồ Chí Minh Highway from Lộ Tẻ T-junction (Cần Thơ City) to Rạch Sỏi Ward (Rạch Giá City) and other major roads in the locality. The province also plans to invest in electricity for agriculture and aquaculture production, and the upgrading of roads on the islands of Kiên Hải, Kien Lương, Phú Quốc District and in Hà Tiên Town. Marine tourism development is a priority in Kien Giang, with the aim of turning Phú Quốc Island into an advanced eco-tourism area for the region and wider world. The maritime economy will also be a focus, with seaport services and shipbuilding receiving investment to satisfy growing demand for cargo and passenger transportation to Cambodia, Thailand and Malaysia./.